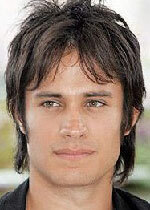 Gael García Bernal, the wildy popular Latin American superstar, has made a big American splash over the last year and a half, with the critically acclaimed and Oscar-nominated AMORES PERROS, and the break-out indie hit, Y TU MAMA TAMBIEN. Born on November 30, 1978 in Guadalajara, Jalisco, García Bernal began his acting career as a child working along side his parents in a number of plays. As a teenager, he obtained the leading role in the soap opera El abuelo y yo (1992). His other work in television includes: Al filo de la muerte; Teresa; an episode of Queen of Swords (2000); Breakfast (2000); and Fidel (2001). He has also appeared in various short films, such as De tripas, corazón (1996) directed by Antonio Urrutia (nominated for the Oscar for Best Short Film), and El ojo en la nuca (2000), directed by Rodrigo Pla. García Bernal studied acting in the Central School of Speech and Drama in London. In 2000, he made his feature film debut in AMORES PERROS. The film, directed by Alejandro González Iñárritu, was nominated for Best Foreign Film at the Academy Awards and the Golden Globes, and won a slew of awards from festivals and awards ceremonies all over the world, including the Ariel (Mexico) for Best Actor. In 2001, García Bernal appeared in Y TU MAMA TAMBIEN, for which he won Best Actor in the Valdivia International Film Festival and the Marcello Mastroianni Award from the Venice Film Festival. Y TU MAMA TAMBIEN, directed by Alfonso Cuaron, made García an international sensation. Other film credits include CEREBRO (2000); DREAMING OF JULIA (2001); SIN NOTICIAS DE DIOS (2001, with Victoria Abril and Penelope Cruz; García won a Goya award for Best Supporting Actor); VIDAS PRIVADAS (2001); LILY AND THE SECRET PLANTING (2002); and I'M WITH LUCY (2002).